Wow! When I saw this cat tree, I thought it was so unique. Such a clever way to add space for your cat while giving your room a whole new dimension. 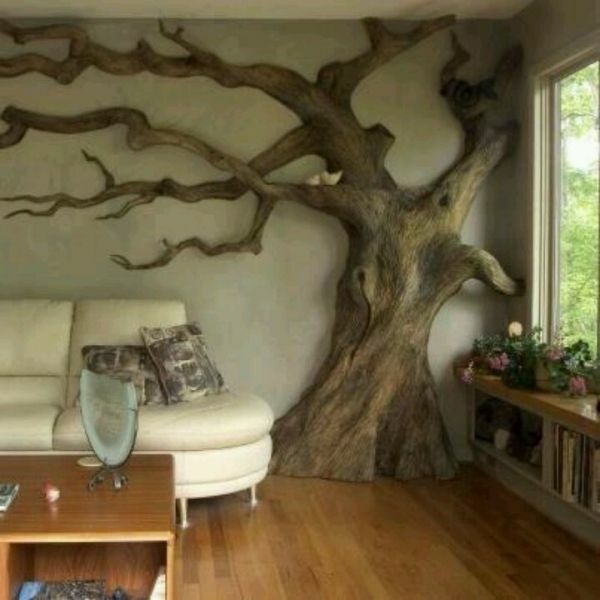 I truly like the feel this room has with the realistic look of the tree. Their cat looks right at home on that branch. It could be fun to decorate it for the holidays with cat toys and fake pine boughs. I know my cats would really enjoy all the space and added activities. I'm sure there was a lot of thought and planning that went into this unique masterpiece. Some drawbacks I see, would be that over time, scratching would really mar the surface. Maintenance might be a challenge if its's made of wood. The wood might dry out and crack so a finish of some type would be necessary. Also, redecorating could pose a problem with its uniqueness. Everyone has their own opinions. Please share yours. It will be interesting to see how many comments come back.